Book directly on our website for the best rate – guaranteed. Your dream stay in Amsterdam doesn’t begin when you first check in to Wittenberg – it starts now, when you make your booking with us. When you book your stay directly on our website, you’ll be guaranteed the best available rate. And on the off chance that you do find a lower rate for the same apartment within 24 hours of making your reservation – we’ll match it. So relax – you’re in the right place. 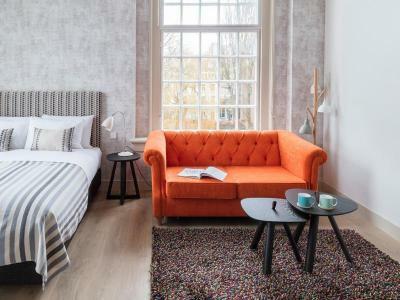 These spacious studio apartments are the perfect base for your stay in the heart of Amsterdam. 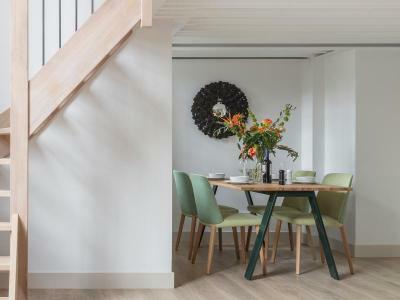 Meticulously-designed to make the most of the natural light and provide an airy, spacious environment, the apartments are ideal for longer stays – a home from home. The kitchen is fully-equipped with all the utensils, pans, dishes and anything else you could possibly need to prepare your favourite meal from scratch. And our super comfortable king-sized beds will give you the ultimate night’s sleep – so you’ll be on top form for whatever the next day brings. 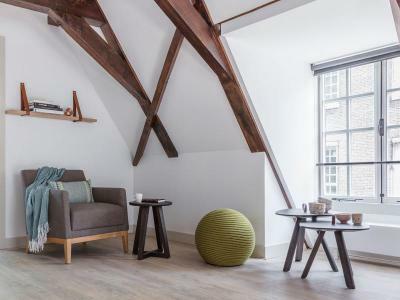 These spacious and stylish two bedroom mezzanine apartments are the perfect base for longer stays in the heart of Amsterdam. Meticulously-designed to make the most of the natural light and provide airy, spacious living, the apartments have a real “home from home” feel. The kitchen is fully-equipped with all the utensils, pans, dishes and anything else you could possibly need to prepare your favourite meal from scratch. And with our super comfortable king-sized beds you’ll enjoy an amazing night’s sleep from the privacy of your own bedroom. One of the bedrooms is located on a quirky mezzanine bed deck. 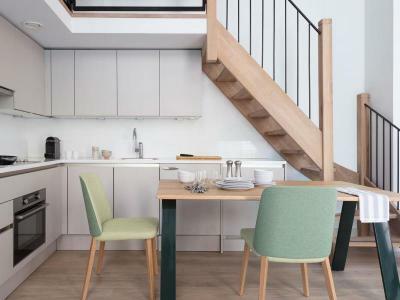 These spacious two bed duplex twin apartments are the perfect base for your stay in the heart of Amsterdam – with the extra space and privacy of a duplex layout. Meticulously-designed to make the most of the natural light and provide an airy, spacious environment, the apartments are ideal for longer stays – a home from home. This beautiful, cosy two bedroom house is perfect for larger groups or families that are staying for a while in the heart of Amsterdam. Meticulously-designed to make the most of the natural light and provide airy, spacious living, the house has a real “home from home” feel. The kitchen is fully-equipped with all the utensils, pans, dishes and anything else you could possibly need to prepare your favourite meal from scratch. And with our super comfortable king-sized beds you’ll enjoy an amazing night’s sleep from the privacy of your own bedroom. There is also a sofa bed in the living room, so the house can sleep up to six people.